We have lead several ATTP implementations. Our roles at customer projects include SAP ATTP Track Lead and GS1/EPCIS Subject Matter Expert. We have assisted with e.g. Process Mapping and Process Guidelines, Packaging line integration to SAP ATTP, Tracelink integration, CMO Integration, 3PL Integration, Serial Number Management and Master Data Management. Pharma IT has experience in setting up connection to the EU Hub. We possess deep insight into serialisation requirements and the impact on pharmaceutical supply chain and we have spearheaded the Supply Chain side of serialisation projects incl. dialogue with 3PLs and CMOs. Furthermore, we have several Project Managers and Test & Compliance Managers with experience from Serialisation Projects. In addition, our network of subcontractors also includes production line engineers. By May 2020 medical devices companies will have to comply with the new EU Medical Device Regulation (MDR). For Vitro Medical Devices (IVMD) the date is May 2022. 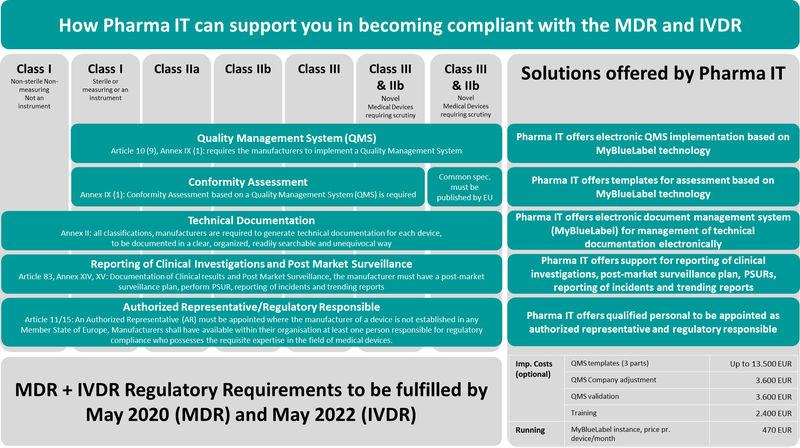 In cooperation with MyBlueLabel, Pharma IT can now offer a turn-key solution and services that will enable small and medium size medical device companies to comply with new regulations listed above. Larger or more complex medical devices companies, pharmaceutical companies and biotech companies might benefit from other solutions, as such Pharma IT work as an agnostic system advisor. The Pharma IT turn-key solution and services can be delivered individually or as a package deal. In this article we have listed the minimum required effort to implement our solution assuming companies will do more work on their own, but additional services can be provided by Pharma IT on an ad-hoc basis, see figure below. Through our work with various EDMS platforms with our customers we have gained significant insight into one of the most predominant technologies in Pharma today: Veeva.